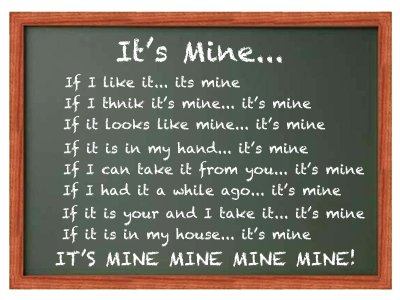 It’s MINE – GO GET YOUR OWN! The proverbial saying “You can’t take it with you” pertains mostly to your wealth that you have at the end of your life and that you should spread it around. Recently I’ve found a couple of instances that have gotten me thinking that this EXACTLY what my fellow Golf Teaching Professionals, Coaches & Facilitators should be doing. That you have spent more than one third of your lifetime (Remember, the second third is the time you spend sleeping!) working in this business for potentially multiple facilities / courses and you don’t care about leaving a legacy behind? I can imagine how there may be plenty of pros who wouldn’t care about leaving a legacy behind, but isn’t that a rather sad thing? Yes it is! 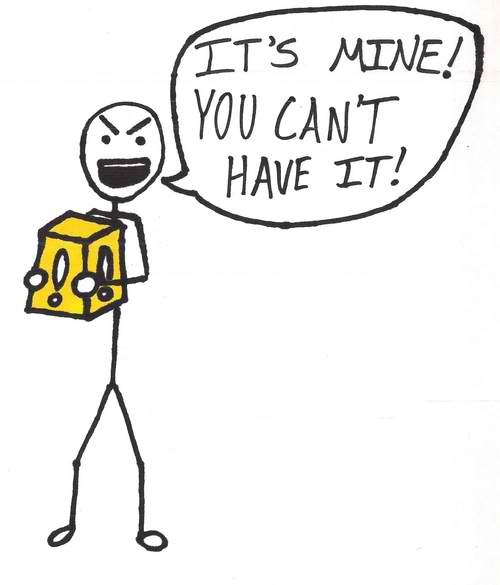 Traditionally we’ve been like this guy in the picture, self centred, greedy and most of all not willing to share what we know, have or use to be successful unless we are getting paid to do it. (I am not saying there shouldn’t be compensation if a possibility) However we’ve wanted to out think, out teach and of course out preform (our student’s results) and shove it down our fellow professional’s throats while saying “Look at me!” That needs to CHANGE now! This year I have personally experienced opportunities where I have been asked questions and consulted others on their Junior swings, programs, ideas and thoughts. I feel honoured and humbled by these requests. But one of the BIGGEST things I’ve done when approached, is I have NEVER said “no”. In fact I find myself asking them questions like “How can I help you more?”. This isn’t just in my world and in fact I have experienced one of the best examples of professional sharing (thank you social media), from this guy below. 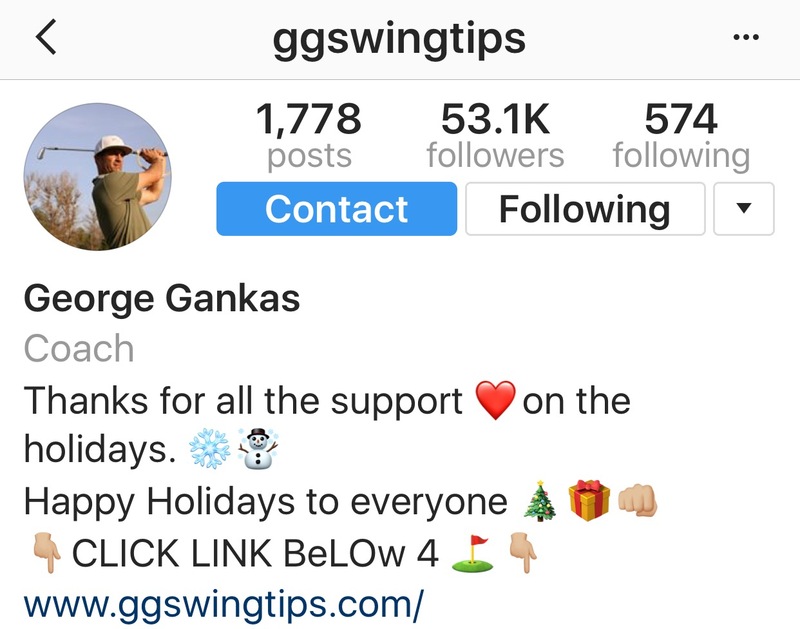 George Gankas has over 53,000 followers on Instagram and whenever I ask him a question, he doesn’t take days to get back to me, it’s immediate and he always does it encouraging and engaging. He is sharing all that he knows through Instagram and Youtube and you CAN pay for more if you want. But it’s the openness and ease of sharing that gives this guy his appeal. (Not to mention the flip flops, flat brim cap and surfer dude speak) It doesn’t hurt that he is really good too! This proactive inclination towards sharing your knowledge is not only an essential and critical learning activity for each and every teaching professional out there, but it is also something that I have been thinking a lot about lately as it pertains towards the concept of leaving a legacy behind. I am a little skeptic to believe that people would feel that sharing is a key point to the success of golf and instruction for the future nowadays, to be honest, I hope they are reading this blog post, because I think that if they aren’t willing to share with everyone they need to look for another job. A legacy is just as important as that one from everyone else by contributing to the general and collective living memory of golf. Can there be anything more rewarding than that? … Specially, when that knowledge shared is reused by others, even when you are not there anymore? … Think about it…. What if you adopted this simple continuous circle this year? Take your knowledge that you’ve created & stored and send it out! Don’t be scared, be helpful and watch how amazing you feel! However you do it you will learn from this experiment and be able to reinvest into yourself the knowledge gained NOT taking all of it with you! Sharing is caring and the key to Golf’s Future.